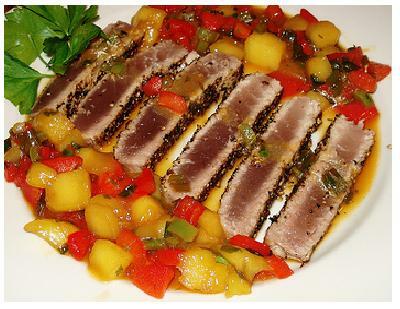 Fresh tuna appears in many spectacular grilled fish recipes. In most recipes, Tuna can be substituted with salmon, swordfish, or monk fish, among others. The following grilled tuna recipe can be made using a grill pan, a broiler, or a charcoal grill. Most folks prefer a grill pan for grilled fish recipes because it's easier to clean. Note: Prepare the salsa at least four hours before cooking, and start marinating the tuna at least two hours before cooking. 4 fresh tuna steaks, each one weighing about 8 ounces. Makes 3 to 4 cups (8-12 servings) of salsa. Mix all of the marinade ingredients together, tasting and adjusting the seasonings as desired. Cover the dish or seal the bag and refrigerate for 2-3 hours. Lightly brush a grill pan, grill rack, or broiler pan with a little bit of oil. Grill the tuna over a medium heat (or broil it if you prefer), turning the pieces over after about 5 minutes. When done, the tuna will flake easily around the edges. Should be a bit pink in the middle. Serve the tuna with a good helping of salsa. This dish goes very well with rice or couscous.